Here’s a look at the latest in the Espion line from Joyetech. 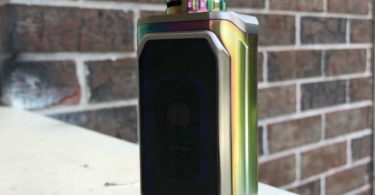 The Joyetech Espion Infinite is the third iteration of mods in the series and it takes on a drastic overhaul from it’s two predecessors the original Espion and the Espion Solo. The first two in the line seemed to bear a James Bond-esque appearance and the name Espion which translates to Spy sort of reinforced that concept. 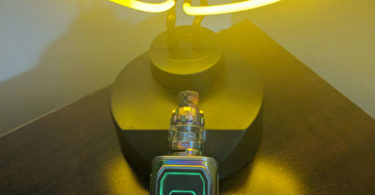 However with the Espion Infinite it hardly seems to be a part of the same line with it’s bright flashy lights and infinity mirror like interface it definitely stands out from the others. 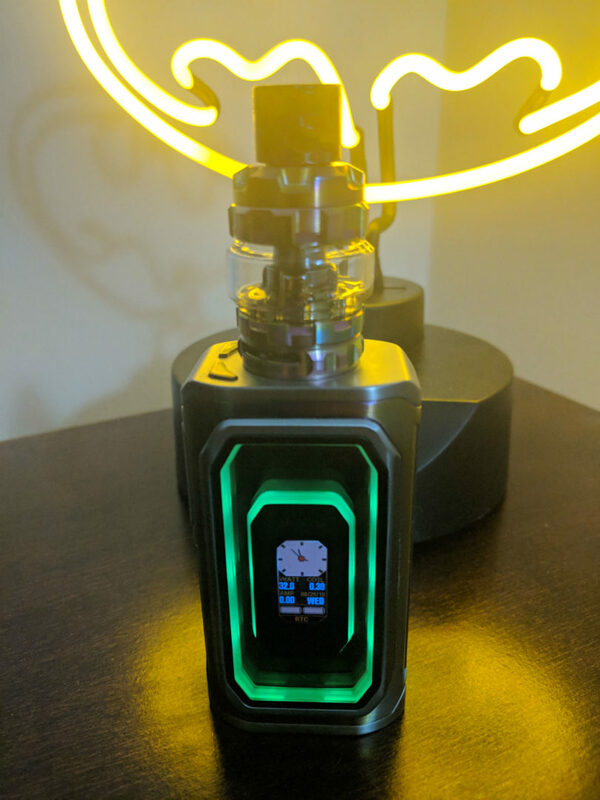 Here are my honest thoughts on the Espion Infinite from Joyetech. The Infinite mod is big and heavy. Being a dual 21700 mod you kind of expect it but it’s not just the batteries that add bulk to this mod. It’s the addition of the front panel which acts as both the display and a light show just like an infinity mirror. An infinity mirror is a mirror that is made to look like it extends to infinity by the use of some lights and some black magic trickery. Most of us have seen something like this in a store display or among some fancy hotels decor. 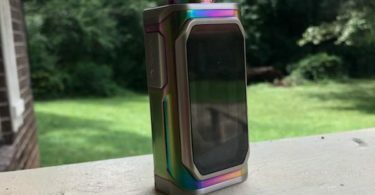 Joyetech couldn’t resist and decided to stick an infinity mirror right smack in to the interface of their latest mod. 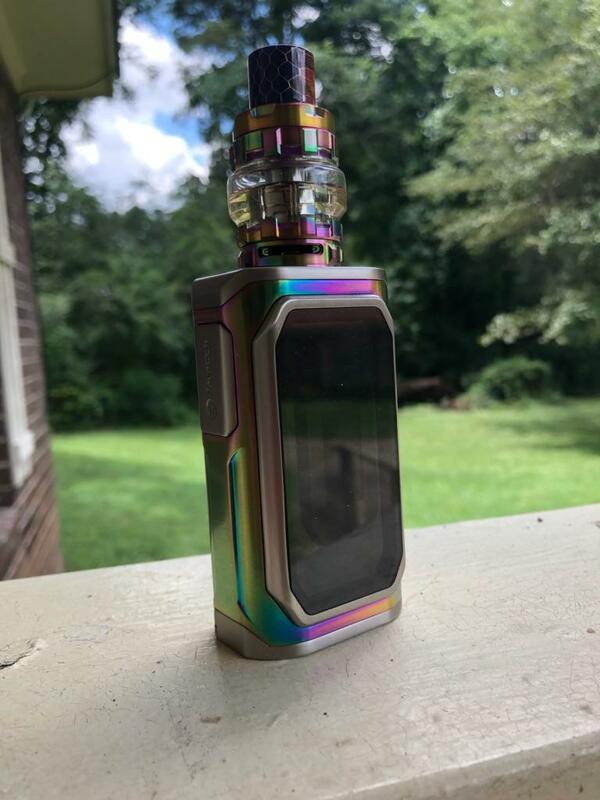 The Infinite mod looks to be mostly made of stainless steel and plastic with a 0.96″ TFT colour screen smack dab in the middle of the devices face. It’s surrounded by that infinity mirror concept I mentioned above which in turn sort of makes the screen look small. It’s not exactly the brightest screen either and despite the light show it can be at times a bit difficult to read especially with no screen brightness adjustment in the menu. The light show does however have a brightness adjustment but even turned down all the way it’s still pretty bright. 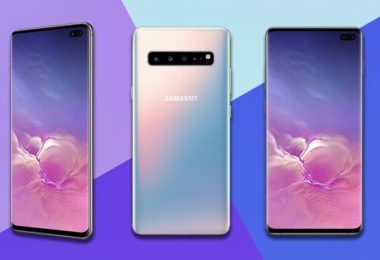 I personally don’t feel like the infinity mirror light show really adds anything to the mod other then some visual appeal and for the most part have been turning the lights off in an effort to save battery life. 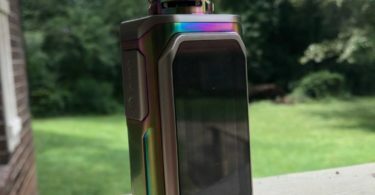 The top of the mod offers up a lot of space for fans of big atomizers and being 33mm wide it should support most things up to 30mm without any issues. The 510 connection threads appears to be stainless steel with a gold plated spring loaded 510 center pin in the middle. The threads are nice and smooth and so far I haven’t had any issues with it and all of the gear I’ve tried on it has sat flush. 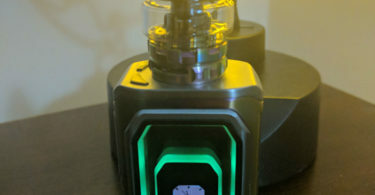 Also on the top of the device are the two adjustment buttons which I think I would have preferred they be on the side or face of the mod for convenience sake. They’re pretty much the only limiting factor on the top of the mod when it comes to attaching big atomizers but still look like they give plenty of space for 30mm gear, anything beyond that will probably sit over the adjustment buttons. I don’t own anything that big so can’t test it out myself. Another concern I have up top is I can see light bleeding through the right adjustment button and can imagine liquid leaking down into the device through there. I’ve already had one leaky tank spill it’s guts on the buttons but luckily I haven’t seen any liquid make it’s way down in to the screen yet. Down the side of the device its got a slightly rounded stainless steel button engraved with Joyetech that’s very similar to the buttons on the Original Espion and the Solo. It’s nice and clicky and feels good under the thumb and I don’t have any rattle coming from mine. On the back of the device is where they’ve hidden the micro USB port for charging and firmware updates. The device boasts 2A quick charging but at the time of this article there aren’t any firmware updates available. Aside from the USB port there’s a bit of styling which adds a bit of texture to what would have been a rather plain looking backside. On the bottom is the dual 21700 battery door which slides to unlock and swings open. The springiness of the battery terminals helps keep the door feeling solid. There’s also some little holes drilled through the battery door should anything go wrong and your batteries need to vent. I haven’t had any issues with the batteries or the battery door coming open so far and it feels solid putting them in and taking them out. 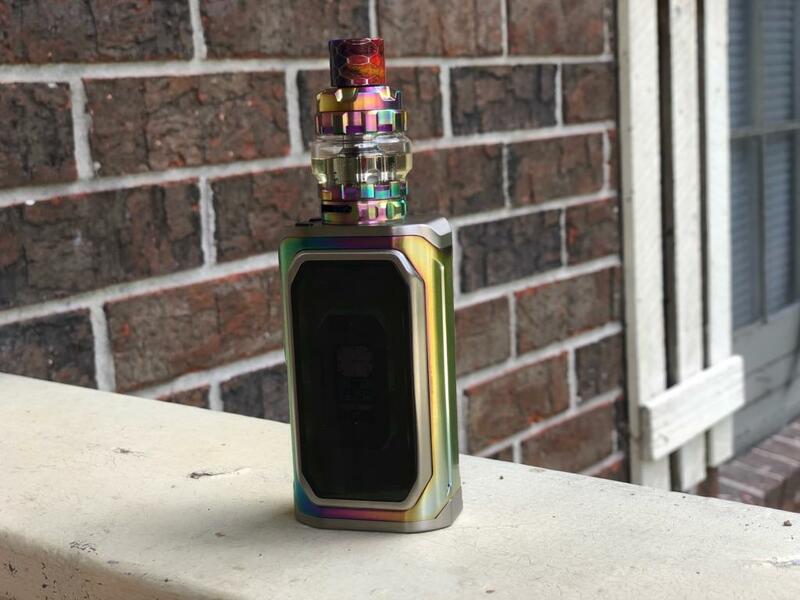 The features and functions are surprisingly close to those from the original Espion mod with the biggest change probably being it can now fire up to 230W. It uses the standard five clicks to turn the device on and off and three clicks to enter the main menu. They’ve opted to ditch the recently added function button which seemed a bit redundant to me anyway. Once in the menu if you chose MODE it gives you options for POWER, RTC(Real Time Clock), TC Ni, TC Ti, TC SS and TCR M1-3. The main screen will vary quite a bit depending on which option you chose and if choosing the RTC you have the choice of analog or digital clock faces. The device is also smart enough to retain the time and date should you remove the batteries. If you select SET or SETTINGS in the menu you have options to LOCK/UNLOCK your resistance for TC, you can set the default POWER for TC and TCR and you can chose which SUBPARA or SUBPARAMETER you want to display on the main screen with options for Puff Time, Puff Count and AMP. You can also set the TIME and DATE, setup PREHEAT which gives you options for power and duration and setup the devices TIMEOUT values. In the LED sub-menu you can chose how and when the light show is displayed as well as adjust brightness and chose the pattern it displays in. EXIT just lets you exit the main menu. 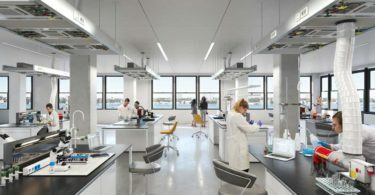 In the weeks that I’ve been using it I really don’t have many complaints worth mentioning and after running it through my usual set of tests it seems to function exactly as I would expect. Power seemed accurate, temp control seemed to do the job with the SS, Ti and Ni coils I tried with it. It also seemed to have good battery life but as I mentioned above that was mostly with the lights shut off. 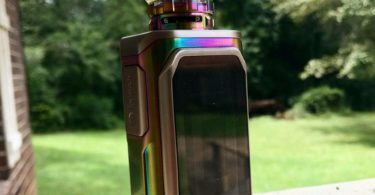 Due to the large output range of 1-230 watts, the Joyetech Espion Infinite is capable of firing up pretty much any build you can imagine or install on the Procore Conquer tank. 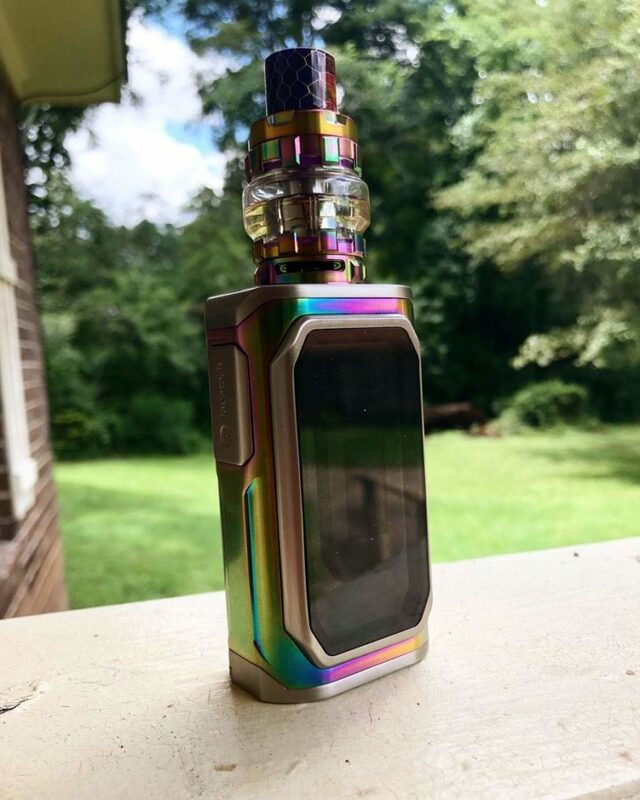 While not included in the kit, the tank also supports a variety of coils designed and manufactured by Joyetech such as the ProC1-S, a 0.25-ohm coil head designed for mouth to lung users, or the ProC4, a 0.15-ohm head which uses a quad coil configuration for even more cloud production. 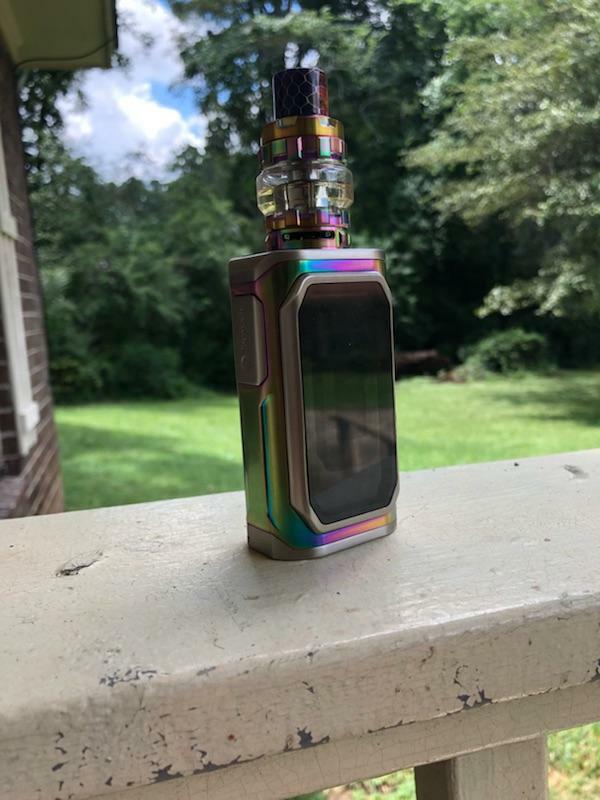 The Joyetech Espion Infinite doesn’t lack any of the features or vaping modes that’s come to be expected of a device of this caliber. Temperature control for nickel, stainless steel, and titanium coils are all supported. The adjustable TCR allows for up to three memory presets, more than enough for storing all your fine-tuned preferences. Customizable preheat settings are also included as part of the chipset, suited for firing up bigger and harder to heat up coils in wattage mode, for minimal ramp-up time. 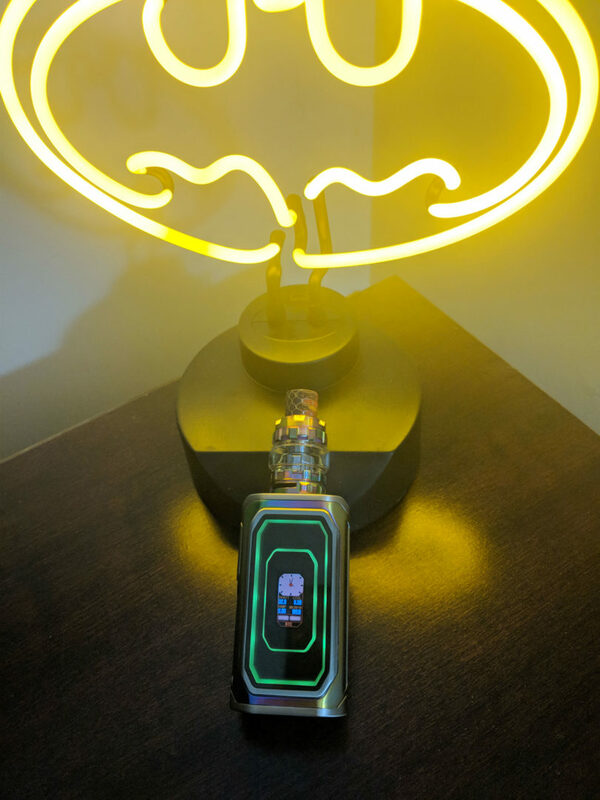 The Joyetech Espion Infinite is decently sized for a device of its capabilities. Measuring in at 49.5mm by 33mm by 140.5mm, it’s got a bit of girth to it, but it’s definitely not big enough as to make the mod a hindrance when trying to pocket it. The lack of any sharp edges makes gripping the mod reasonably comfortable, especially for extended vaping sessions. Those concerned about the Joyetech Espion Infinite’s battery life should have nothing to worry about. 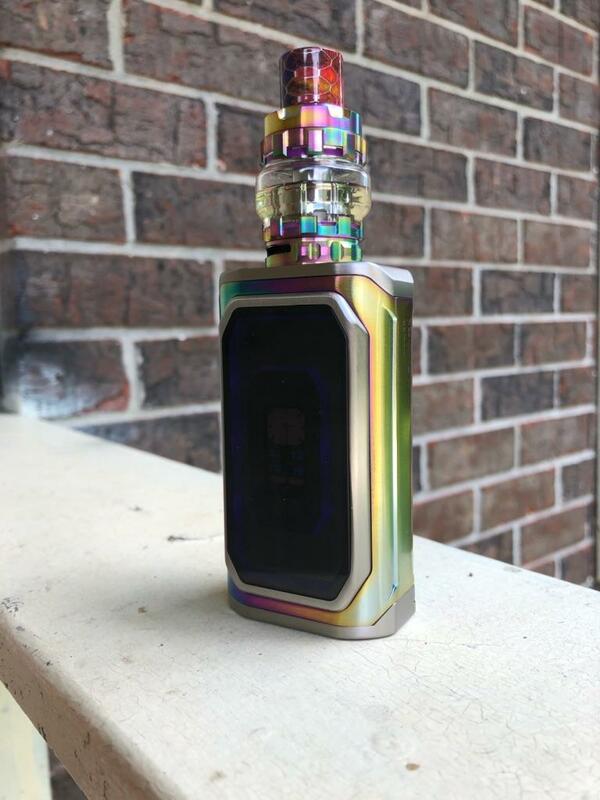 The dual 21700 or 18650 battery setup provides literally days of non-stop vaping before requiring a recharge. The mod supports direct charging with a micro USB port that charges at a rate of 2 amps max. Still, it’s always more advisable to use a separate external charger when multi-battery setups are involved. The ProCore Conquer that comes with the kit is essentially the next evolution in the ProCore series of tanks. 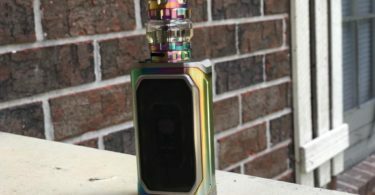 It’s extremely similar to the ProCore Air and the ProCore X I reviewed with the two other Espion devices and shares the same list of features but with slightly more capacity, up to 5.5ml from 4.5ml the X and Air both supported. 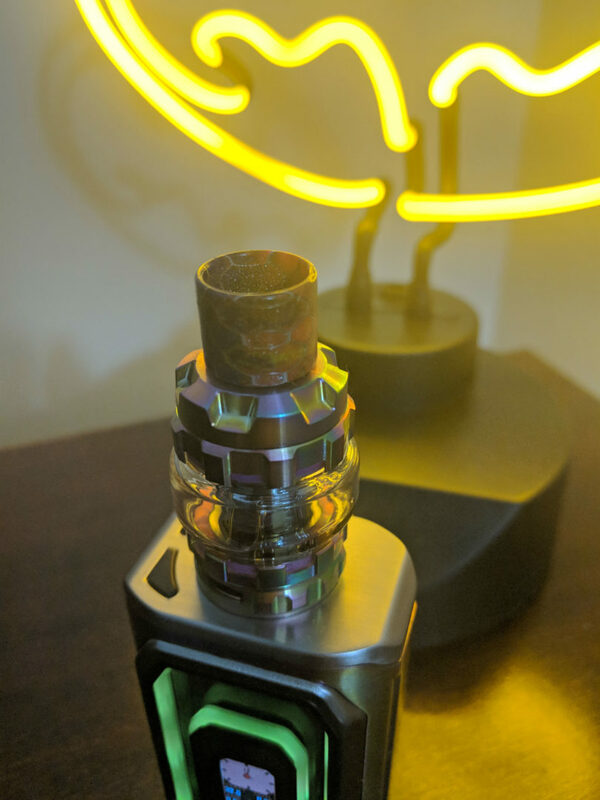 Aside from that it uses a very similar slide open top fill, bottom adjustable airflow and supports the same series of coils. However it now comes equipped with a new ProCD 0.15ohm mesh coil as well as the same ProCA 0.4ohm head we saw with the Espion Solo kit. The top fill is easy to use and for the most part mess free. It comes equipped with a smoked bubble tank glass but also includes a clear straight replacement tank if the bubble tanks aren’t your thing. The bottom adjustable airflow is also easy to use with stops at either end but no clicks to hold it in place. I found it’s fairly stiff though and shouldn’t move around by accident. 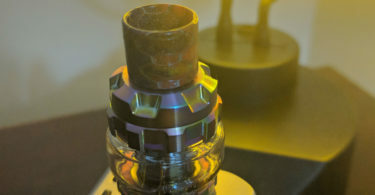 Replacing the coils is easy too but can be a bit messy as you have to unscrew the coil from the base which will likely be covered in e-liquid. While admittedly I’ve barely turned the lights on with this thing I can’t really complain about the build quality and performance of the kit itself and for the most part I’ve quite enjoyed using it the past few weeks. With dual 21700 batteries the power and battery life I’ve been getting from it has been fantastic. 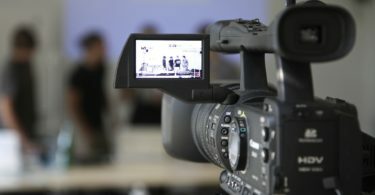 I could easily recommend this kit to anyone looking for a device with long battery life and a good performing subohm tank. I also think it would especially appeal to those who like to show off just a little bit with the flashy infinity mirror interface it sports. 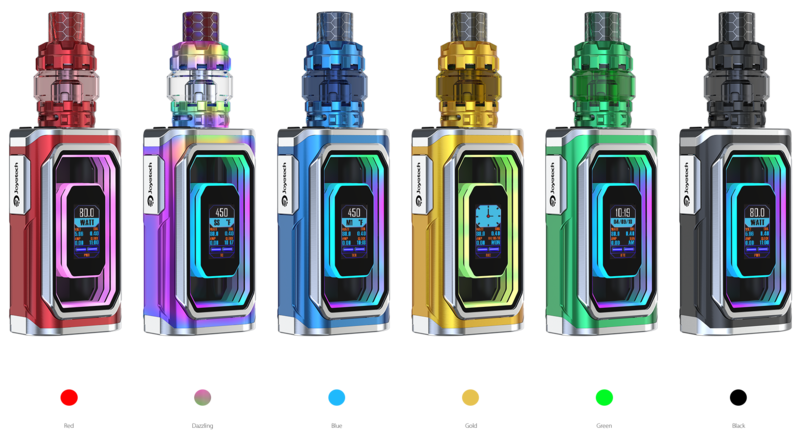 The Joyetech Espion Infinite will run you $82.40 for the entire kit that gets you everything listed above which is a pretty good deal as it gives you everything you need to start vaping if you’re new to the scene of vaping.